The majority of prehistoric documentaries produced these days are from either a British standpoint by companies such as the BBC, or Americanised with Discovery or National Geographic. Thankfully, some local production companies with the help of the Australian Government and SBS have teamed together to focus on a largely untold section of our planets biological history, the great Australian Megafauna. Interviewing scientists from all across the globe, the feature brings light to the Australian beasts that once roamed this great wide land around 50,000 years ago. Using brilliantly imaginative 3D animation and rendering, the environment and creatures themselves are lovingly recreated and brought to life on screen, giving a rarely seen glimpse into our ancient marsupials and lizards. The key question in case here is, with Australia having such a unique environment, what made these giant ramblers simply vanish? Surely the case of some sort of cataclysmic event that seemed to wipe them from our land forever. Through great expert interviews, detailed narrative, and connecting recreations, it journeys through explaining who the beasts are that are in question, and also a run of suspects from climate change, to perhaps the ultimate suspect, the introduction of man to their timeline. 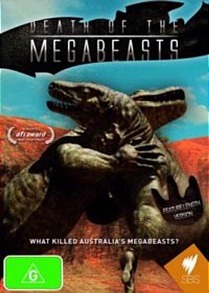 ‘Megabeasts’ does exactly what a documentary of this sort of topic needs to do, be informative whilst entertaining. The 3D animation is fantastic and is now also AFI nominated, and shows the giant natives like they’ve never been seen. Adding to the DVD’s value there is also a extra 46 minutes worth of footage from its original airing, so even people who watched it on TV will get a great kick from the DVD. The Special Features is a bit slim with just a ‘Making Of’ but the making of itself is also very informative and quiet surprising. All in all, it’s a fantastic release and something that will still be relevant for a long time to come.